Star actor Bob-Manuel Udokwu yesterday afternoon led a Nollywood delegation to storm the All Progressives Grand Alliance (APGA) rally in Onitsha to push for the candidacy of Chief Willie Obiano during the November 16 Anambra governorship election. The team which featured Amechi Muonagor and some key directors, writers and producers implored Onitsha residents to queue behind Obiano in the coming election. 'APGA is the only party that has recognised that actors and actresses are normal human beings who have a lot to contribute to the accelerated growth of Nigeria. They extended hand of fellowship to us by giving us appointments that would enable us to contribute to society,' Udokwu declared. The team performed little dramatic skits knocking the recent deportation of indigenes of the state by the APC led government in Lagos. They also dramatised the forced exit from of Senator Chris Ngige, candidate of the All Progressives Congress (APC), from his position as governor during his last stint in the Amawbia Government Lodge in Awka. The Nollywood team urged Onitsha residents to cast their votes for Chief Obiano. Onitsha, the leading commercial city in south eastern Nigeria, practically ground to a halt as residents of the city and environs poured into All Saints Cathedral field to cheer the APGA team led by the National Chairman of the party, Chief Victor Umeh, Governor Peter Obi, the party's flagbearer, Chief Obiano, and former gubernatorial aspirants on the APGA platform and party stalwarts. The rally which attracted an unprecedented crowd may well be the turning point in the heated race for the successor of the incumbent governor as it brought together all the leading political figures and opinion leaders from across the three senatorial zones of the state in one place. In a carefully worded speech, Umeh flayed what he described as an attempt by APC to impose a leader on the people of the state, declaring that with APGA, Ndigbo have attained enough maturity to take their own destiny in their own hands. 'How can someone from a different part of the country come here to tell us who should lead us? Does APGA choose the governor of Lagos State for Lagosians? We shall choose our leaders ourselves and our leaders shall come from our own platform, APGA. We shall not allow any stranger, no matter how powerful to come here to dictate to us. We shall resist that with the last drop of strength in us,' Chief Umeh declared. He called on the residents of Onitsha to cast their votes for Chief Obiano as it was the only alternative to a return to the unpleasant past where governance in the state was reduced to violent clashes between godsons and godfathers. In his own speech, Chief Obiano assured that he would lead Anambra to a higher level of development. 'My brother, Governor Obi, has done very well and I wish to assure you that I will continue his good work and push the development of Anambra State to a much higher level,' he stated. Chief Obiano promised to implement free education in Anambra State from primary to secondary school, under his regime. He also assured senior citizens of the state who are 70 years and above of free medical care in the state. 'I shall rebuild our hospitals and ensure that they are adequately equipped to handle complex medical cases. This will stem the trend of Nigerians heading to India for a medical attention at the slightest medical excuse,' Chief Obiano assured. He further explained that he has evolved a concept known as The Wheel which consists of four key areas that would stimulate the development of the state under his regime; namely trade and Commerce, Agriculture, industrialization and oil and gas. 'Our people have always excelled in the area of trade and commerce. I will create the enabling environment that will boost their comparative advantage in this area,' he further assured. Governor Obi, on his part, thanked the residents of Onitsha for turning out in large numbers to grace the rally. He endorsed Obiano as the right man to continue his legacy and lead Anambra to greater heights of achievement. Earlier in her remarks, Senator Chris Anyanwu who represents Owerri Central District on the platform of APGA had called on the people of Anambra State to rally round APGA and Chief Obiano in the coming election. 'Anambra is very important in Igboland. If Anambra falters, the rest of the Igbo nation will fall. The world is watching you. The rest of your Igbo kinsmen are watching you to play the role of the leader. So much depends on how you conduct yourselves in this election. APGA must not lose this election,' Senator Anyanwu advised. The hugely successful rally had in attendance former gubernatorial aspirants on the APGA platform who turned en-masse to lend their support to Chief Obiano. 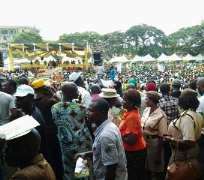 •Photo shows part of the crowd at the APGA governorship rally in Onitsha.